Nonstick fry pans like the Circulon Fry Pan are becoming more and more popular in many kitchens. Why? 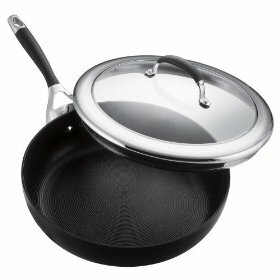 Because these pans allow people to cook a variety of items like pancakes, seared burgers, and omelets easily, without the food adhering to the pan. Better still, for health conscious households this type of fry pan needs little oil or butter to achieve that goal. Fry pans are among the most utilized pans in every kitchen. The Circulon Fry Pan is well designed, with deep sloped sides so food will slide right out. It also can be easily used as both an open or covered pan. The 12 inch size provides a fairly good cooking surface for a medium sized meal and of course the nonstick surface is great for fast, easy cleaning. Circulon elite cookware is not dishwasher safe, you must hand wash only. Several consumers have complained about the heft of the handle on the fry pan. They also reported that the nonstick surface seemed to begin to fail after between 8 months and one year of use. On the upside many consumers love the overall size of the pan, the ability to cook with very little oil (note: do not use cooking spray  this voids your warranty), the insulated handle, see through lids (to retain heat) and the nonstick cooking surface that keeps food from sticking and makes for very quick clean up after meals. Flared edges for easy pouring. Overall, from all the reviews we have read the Circulon fry pan has gotten mostly good reviews from consumers. The cost of the fry pan is a little pricy at around $70.00. Customers that had any problems, received excellent customer service with thier problems.